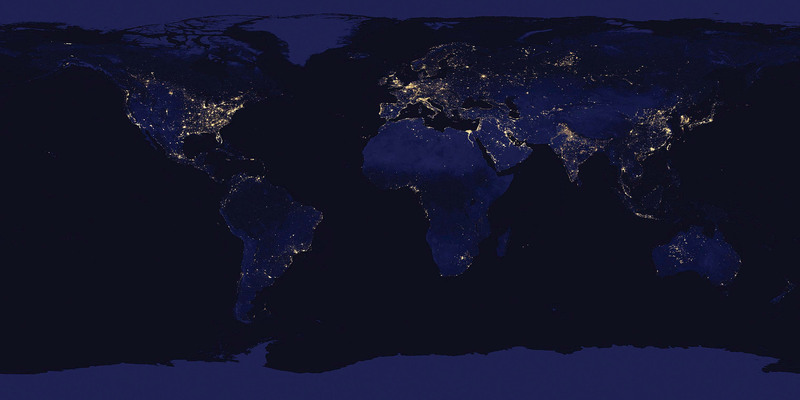 Scientists have unveiled an unprecedented new look at our planet at night. A global composite image, constructed using cloud-free night images from a new NASA and NOAA satellite, shows the glow of natural and human-built phenomena across the planet in greater detail than ever before. Many satellites are equipped to look at Earth during the day, when they can observe our planet fully illuminated by the sun. With a new sensor onboard the NASA-NOAA Suomi National Polar-orbiting Partnership (NPP) satellite launched last year, scientists now can observe Earth’s atmosphere and surface during nighttime hours. The new sensor, the day-night band of the Visible Infrared Imaging Radiometer Suite (VIIRS), is sensitive enough to detect the light from a single ship in the sea. VIIRS day-night band images are providing researchers with valuable data for a wide variety of previously unseen or poorly seen events. With its night view, VIIRS is able to detect a more complete view of storms and other weather conditions, such as fog, that are difficult to discern with infrared, or thermal, sensors. Unlike a camera that captures a picture in one exposure, the day-night band produces an image by repeatedly scanning a scene and resolving. This new class of meteorite was found in 2011 in the Sahara Desert. Designated Northwest Africa (NWA) 7034, and nicknamed “Black Beauty,” it formed 2.1 billion years ago. The meteorite’s composition is different from any previously studied Martian meteorite. “The contents of this meteorite may challenge many long held notions about Martian geology,” said John Grunsfeld, associate administrator for NASA’s Science Mission Directorate in Washington. The quest to determine if planets like Earth are rare or common is taking another stride forward on the journey. Using NASA’s Kepler spacecraft, astronomers are beginning to find Earth-sized planets orbiting distant stars. A new analysis of Kepler data shows that about 17 percent of stars have an Earth-sized planet in an orbit closer than Mercury. Since the Milky Way has about 100 billion stars, there should be at least 17 billion Earth-sized worlds. Scientists have also determined that nearly all sun-like stars have planets. Kepler is the first NASA mission capable of finding Earth-size planets orbiting in or near the habitable zone of the host star. Using NASA’s Hubble Space Telescope, astronomers have uncovered a previously unseen population of seven primitive galaxies that formed more than 13 billion years ago, when the universe was less than 3 percent of its present age. The deepest images to date from Hubble yield the first statistically robust sample of galaxies that tells how abundant they were close to the era when galaxies first formed. Looking deeper into the universe also means peering further back in time. The newly discovered galaxies are seen as they looked 350 to 600 million years after the big bang. Their light is just arriving at Earth now. A major goal of the new program was to determine how rapidly the number of galaxies increased over time in the early universe. “There wasn’t a single dramatic moment when galaxies formed. It was a gradual process,” said Brant Robertson of the University of Arizona in Tucson. A new NASA-funded prototype system developed by the National Center for Atmospheric Research (NCAR) of Boulder, Colo., now is providing weather forecasts that can help flights avoid major storms as they travel over remote regions. The system is based on products that NCAR has developed to alert pilots and air traffic controllers about storms and related hazards, such as turbulence and lightning, over the continental United States. “By providing pilots with a picture of where significant storms will be during an eight-hour period, the system can contribute to the safety and comfort of passengers on flights,” said NCAR’s Cathy Kessinger, lead researcher on the project. Pinpointing turbulence associated with storms over the oceans is far more challenging than it is over land because geostationary satellites, unlike ground-based radar, cannot see within the clouds. As a result, pilots often must choose between detouring hundreds of miles around potentially stormy areas or flying directly through a region that may or may not contain intense weather. Storms may be associated with hazardous windshear and icing conditions in addition to lightning, hail and potentially severe turbulence. Building on the success of Curiosity’s Red Planet landing, NASA has announced plans for a new robotic science rover set to launch in 2020. The plan to design and build a new Mars robotic science rover with a launch in 2020 comes only months after the agency announced InSight, which will launch in 2016, bringing a total of seven NASA missions operating or being planned to study and explore our neighbor. The future rover development and design will be based on the Mars Science Laboratory (MSL) architecture that successfully carried the Curiosity rover to the Martian surface last summer. “The challenge to restructure the Mars Exploration Program has turned from the seven minutes of terror for the Curiosity landing to the start of seven years of innovation,” NASA’s associate administrator for science, and astronaut John Grunsfeld said. Using computer simulations, scientists are shedding light on a question that has challenged astronomers for years: What causes wide binary stars? Binary stars are pairs of stars that orbit each other. Wide binary stars are separated by as much as one light-year in their orbits, farther apart than some stellar nurseries are wide. Researchers simulated the complex motions of newborn triple stars still embedded in their nascent cloud cores. They studied the motions and concluded the widest binary systems began as three stars. Most stars are born in small, compact systems with two or more stars at the center of a cloud core. When more than two stars share a small space, they gravitationally pull on each other in a chaotic dance. The least massive star often is kicked to the outskirts of the cloud core while the remaining stars grow larger and closer by feeding on the dense gas at the center of the cloud core. If the force of the kick is not forceful enough, the runt star will not escape, but instead begin a very wide orbit of the other two, creating a wide binary. However, sometimes astronomers find only two stars in a wide binary. This means either the star system formed differently or something happened to one of the original binary pair. The wide binary nearest to Earth is Alpha Centauri. The star itself is a close binary. Alpha Centauri has a small companion, Proxima Centauri, which orbits at a distance of about one-quarter of a light-year. NASA is sending a remotely piloted research aircraft as high as 65,000 feet over the ocean to probe unexplored regions of the upper atmosphere for answers to how a warming climate is changing Earth. Water vapor and ozone in the stratosphere can have a large impact on Earth’s climate. The processes that drive the rise and fall of these compounds, especially water vapor, are not well understood. The Airborne Tropical Tropopause Experiment (ATTREX) will study moisture and chemical composition in the upper regions of the troposphere, the lowest layer of Earth’s atmosphere. Studies have shown even small changes in stratospheric humidity may have significant climate impacts. Scientists hope to use the acquired data to improve global model predictions of stratospheric humidity and composition. ATTREX is one of the first investigations in NASA’s new Venture-class series of low- to moderate-cost projects. In one of the most remote lakes of Antarctica, nearly 65 feet beneath the icy surface, scientists have uncovered a community of bacteria. This discovery of life existing in one of Earth’s darkest, saltiest and coldest habitats is significant because it helps increase our limited knowledge of how life can sustain itself in these extreme environments on our own planet and beyond. Lake Vida, the largest of several unique lakes found in the McMurdo Dry Valleys, contains no oxygen, is mostly frozen and possesses the highest nitrous oxide levels of any natural water body on Earth. A briny liquid, which is approximately six times saltier than seawater, percolates throughout the icy environment where the average temperature is minus 8 degrees Fahrenheit. Despite the very cold, dark and isolated nature of the habitat, the brine harbors a surprisingly diverse and abundant variety of bacteria that survive without a current source of energy from the sun. “This system is probably the best analog we have for possible ecosystems in the subsurface waters of Saturn’s moon Enceladus and Jupiter’s moon Europa,” said Chris McKay, a senior scientist at NASA’s Ames Research Center, Moffett Field, Calif.